The aim of the game is to get the Yooyu into the opponents' goal and score more than your opponent does in the three minute match. The more you score and the better you defend, the better the final score will be. In order to play Yooyuball, you can use your keyboard or your mouse. You control the players on the pitch with the arrow keys of your keyboard or your mouse. The closest player from the ball is automatically selected. All your other players are controlled by the computer and they run all around the place. If there is one key that comes very handy in the newest version of Yooyuball, it's surely spacebar. You use that key to shoot into the opponents' goal. If you hold spacebar while you carry the ball, you notice a power indicator. It adds a strength factor to your shot when you release your spacebar. Spacebar is also the key to press if you fancy passing the ball to one of your teammates. 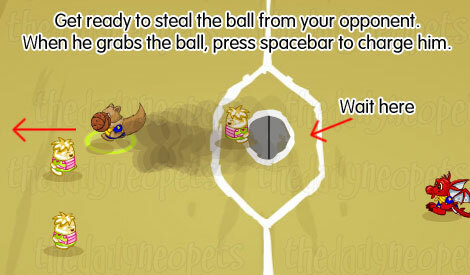 Moreover, it's now possible to steal the ball from your opponent by pressing spacebar. If you are not using the keyboard, then a left mouse click would do all the actions above! Use shift key on your keyboard to call all the players (apart from the one you are controlling) back to their pre-defined positions. This is useful for off-Yooyu attack. First of all, let's take a look at the configuration of the pitch. If you play left to right, then you have to mentally inverse everything, which means that you would be scoring on the right side instead of the left side. Before your players enter on the field, you get to choose your direction of play and your formation. While the direction of play doesn't affect the game play other than by influencing on which side of the field you score your points, it is crucial that you understand the difference between the three possible formations. This offensive formation is perfect for those who like to swing Yooyus in the net as fast as they can. The only downside is that once your opponent grabs the ball, there is only one defender in their way to prevent them from scoring against you. Recommended for expert Yooyuball players. This defensive formation is perfect for those who have difficulties keeping control of the Yooyu. It's basically the opposite of the first formation, leaving three players in the back to put in place a counterattack plan. Recommended for beginner Yooyuball players. This formation is the perfect compromise between an offensive and a defensive strategy. At the kick-off, you automatically control the top player. In case your attacking plan fails, two strong defenders are left behind to block your opponent. The main downside of this formation is that your defenders don't cover the center of the field. Be sure to block the central gap as best as you can, or it becomes highly challenging for your goalkeeper to make a save. Recommended for average Yooyuball players. Be sure to try all the formations to see which one suits better your playing style. Another new addition to this year's Yooyuball is the addition of power-ups. There are four powerups which can appear anywhere on the field, but will disappear if not picked up after a certain time. To pick them up, simply run over them with one of your team members. Each lasts only a limited amount of time. At least one appears in every game. Gives your team an extra burst of speed to push to the goal! This power-up speeds up your team, which allows you to run faster than the opponents. This helps escape steals by the opposing team. The most common power-up. Makes the opponent's goal larger, giving your team easier scoring opportunities. There's not much else to say about this one. It simply makes it nearly impossible for the goalie to guard the entire thing, making scoring (even with yooyus that veer) much easier. The second most common power-up. This power-up will definitely put you head and shoulders above the competition! This power-up turns everyone on your team into a giant for a limited period of time. As giants, your team members are bigger and stronger than your opponents, and kick with increased power. The second rarest power-up. Screenshot Stop the other team dead in its tracks and head to the goal unopposed! This freezes each of your opponents in a block of ice. If they have the yooyu at the time of the freezing, it is still possible to steal it from them. To grab the yooyu, steal it from the opponent after positioning yourself next to him. The rarest power-up. There are 7 different types of Yooyu; Normal, Snow, Fire, Mutant, Faerie, Darigan and Robot. We'll go into detail with these Yooyus later, but here's some general information about how the Yooyus work in the game. Each Yooyu is picked completely at random. It bursts dramatically through the game screen to reveal its identity to you right before your match begins. (You can skip this scene by hitting the Spacebar on your keyboard). When the play commences, it sits in the centre of the field ready to be picked up by either team. It's a race to get to the Yooyu, remember. From here on, the Yooyus will display their unique characteristics, depending on which one was chosen. The most common Yooyu in Yooyuball. It behaves, well, fairly normally. 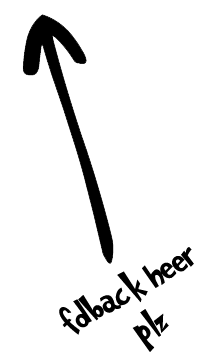 It travels at the game's normal speed and follows a standard straight line trajectory. The fastest ball you encounter in the game. It behaves the same way as any normal Yooyu, following a straight line pattern. Since this type of Yooyu can travel a long distance very quickly, it's advisable to aim at the goal from a greater distance. The slowest ball you encounter in the game. It also follows only straight line patterns, but at a very slow pace. It's better to shoot this Yooyu when you're fairly close to the goal. Remember that you can hold spacebar to boost your power, which comes in handy when you are dealing with this type of Yooyu. Even though it acts like a normal Yooyu, the Clockwork Yooyu is a wind-up robot and is set to explode shortly after the kick-off. Be sure to place it in the goal as soon as you can to avoid a big boom! You won't be penalised if a Clockwork Yooyu explodes, but you will have to start over with a new ball and lose crucial seconds. Because of its wings, this type of Yooyu is able to float above the field and tends to fly in an arc. The sharpness of the curve varies. Probably the most annoying ball you encounter on the field. This type of Yooyu flies at unexpected angles. The best strategy for this type of ball is to keep it on your opponent's side of the field and let them take it from you. Eventually they'll get it into their own goal. This type of Yooyu is highly unpredictable in that it can mimic the patterns of any other type of Yooyu except Clockwork. It's best to treat it as a normal ball and hope that it will act nicely. This section offers you tips to get the ball from the kick-off, to score with the seven different type of Yooyu and to improve your defense. In the past, players were always eager to get the ball from the kick-off. While it's still possible to be the fastest to reach the ball, expert yooyuballers prefer to adopt a sneakier method. When the ball is released from underneath the field, move forward and stop at the first white line you encounter. From that point, be prepared to press spacebar as soon as the forward player from the opponent's team touches the ball. 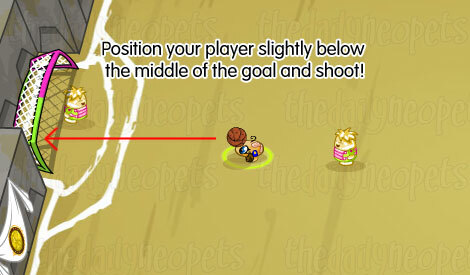 You will charge the player, steal the ball from him and gain a boost of speed that is really useful to score quickly. The forward player controlled by the computer will probably steal the ball from you if you don't use that strategy! At the kick-off, charge the opponent as soon as he touches the ball! Now that you control the ball, your only objective is to put in the goal! There are many strategies that can help you to win your Yooyuball match. Earlier, we gave a description of the seven different Yooyus that you encounter in the game. Now we are explaining how to score with them! Generally speaking, you run to the goal in almost straight line, holding spacebar to fill the power bar, and release it when you are ready to score. Normal, Snow, Clockwork, and Fire Yooyus are happily following straight line trajectories, which means that you can use the same strategy to score with all of them. It's also a good idea to always treat the Mutant Yooyu as a Normal Yooyu, even though the Mutant one is unpredictable. The only noticeable difference between the aforementioned types of Yooyus is the time they take to travel a given distance. Consequently, you can take more risks with a Fire Yooyu than with a Snow Yooyu that will need to be put in the goal from a closer distance than the former. To score with a Normal, Snow, Clockwork, Fire or Mutant Yooyu, shoot on a horizontal, two taps up or down rather than dead center. 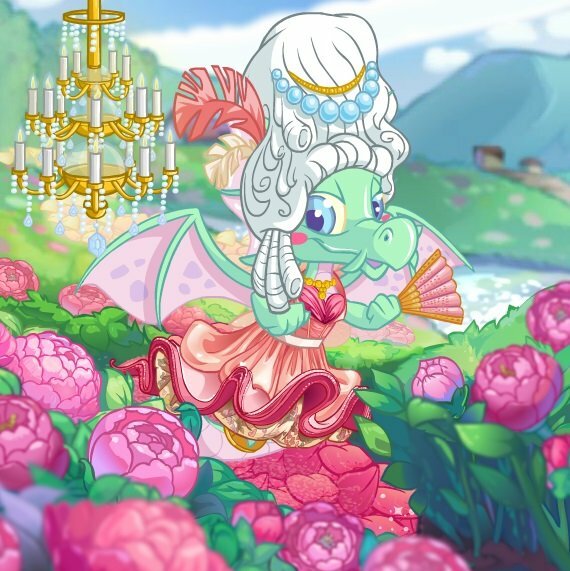 Every now and then, you also need to deal with Faerie Yooyus. This ball has the particularity to fly around in arc. The best way to put it inside the goal is to run in a straight line from the kick-off and to shoot when you are fairly close to the goal. The Faerie Yooyu then curves around the goalkeeper, granting you one point. 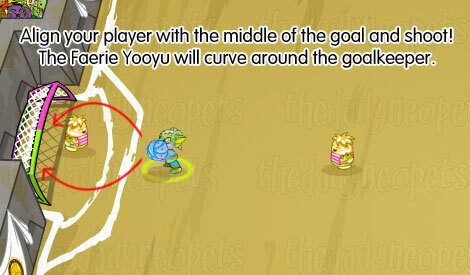 To score with a Faerie Yooyu, align your player with the center of the goal and shoot. It's also possible that you encounter a mischievous Darigan Yooyu that always flies at unexpected angles. With that type of Yooyu, run directly parallel to the net and shoot without stopping or turning. It still has a chance to go on the opposite direction, but that's a risk to take. If necessary, you can simply allow the other team to have the Yooyu and keep it on their side. Chances are, they'll get it in their own goal eventually. 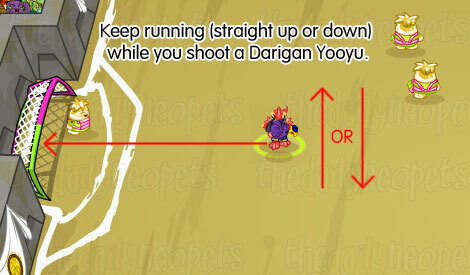 To score with a Darigan Yooyu, remain parallel to the goal and shoot without stopping or turning. Remember that when you press shift, all your players (except the one you are currently controlling) are sent back to their original place. It's always a good idea to send back your players to your side of the field when you lose control of the ball. When your goalkeeper is holding the ball, the other team almost always tries to steal the ball from him and to score in your net. The best way to avoid this is to face the wall with your goalkeeper, hold spacebar to gain power and shoot against the wall. The ball should fly around the field, and hopefully land near one of your forward player. Your goalkeeper won't be able to do all the saves, just accept it and do your best with the next Yooyu. Every June, Altador hosts a competition open to all those in Neopia - The Altador Cup. From Altador to Virtupets, people pick their favorite world and play Yooyuball to see who can be crowned Altador Cup winner. For more information on the Altador Cup check The Daily Neopets' Altador Cup Coverage! So that's it. Hopefully you now know more about Yooyuball to go out and play it yourself. Watch you don't scald your hands on the fire Yooyu as you rebound your way to victory! Hooray!